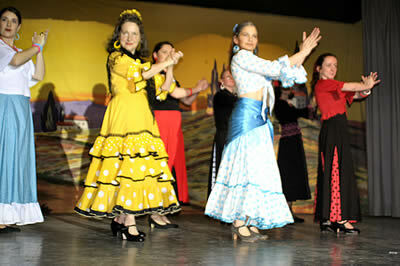 Flamenco is a very popular dance style for small groups. It's not a partner dance and so can suit any mix of dancers. We can provide a demonstration, if required, followed by a dance class for the attendees/delegates. Please note that the below is just an example. We are very experienced in creating bespoke events specifically designed to meet your timings and requirements. Attendees: Up to 12 with 1 teacher. Many more if you have a support teacher/s. Note: For a large Flamenco dance class the main teacher will head up the event and will lead the instruction from a stage or other raised platform. Support teachers/dancers are there to mingle. The teacher will be in costume and provide a brief demonstration of the flamenco dance style. Following the demonstration the teacher will conduct the instruction part of the evening. If support teachers are used they will be there to mingle with the attendees and provide assistance where necessary. There will be a warm-up followed by a taster lesson. If your budget allows we highly recommend that you have a flamenco guitarist present for the lesson. This will give it a much more lively and authentic feel. With the support of the guitarist, the dancer can also SING Flamenco, adding to the overall atmosphere and 'taster' experience. We can also supply mics/mic stands/amps if necessary.